In 1945, the Gardner Watson Funeral Home was established in Warner Robins as a branch of the Gardner Watson Funeral Home located in Perry, GA and owned by Gardner Watson. Mr. Watson lived in Perry and served on the Board of Stewards for the Perry Methodist Church and was President of the State Board of Funeral Service. 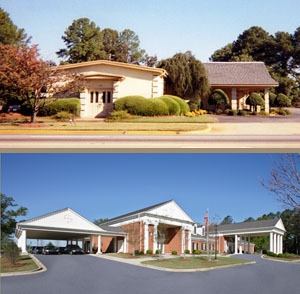 In the beginning, the only service offered out of the Warner Robins location was an ambulance service, with the remainder of the funeral services being handled out of the Perry location. The Warner Robins branch was set up in an old home that was rented from a real estate agency. Mr. Watson saw the need for a full service location in Warner Robins and purchased an acre of land on the corner of Watson Boulevard and Pleasant Hill Road and announced his long-range plan to construct what was then an ultra-modern mortuary (pictured top left). The funeral home was a work in progress for several years. He began with a small location housing a reception room, casket display room, embalming area and living quarters. Attached to the home was a flower shop. Several years later, around 1955, two “reposing rooms”, a garage and the Chapel of Flowers were added. The Chapel of Flowers became somewhat of a Warner Robins landmark. In addition to all the funerals held there, many young couples in Houston County chose the little Chapel as a wedding spot. To this day, we hear these stories. Walter Wainwright became a partner in 1961 and the funeral home was incorporated as Watson-Wainwright Funeral Home, Inc. Continuing to grow, Watson-Wainwright Funeral home added another partner on April 1st, 1964 when Jimmy McCullough joined the firm. The name was changed, again, to Watson-Wainwright-McCullough Funeral Home. Jimmy McCullough had worked at Gardner Watson as a teenager, and later graduated from the Cincinnati College of Embalming in Ohio. He began serving his apprenticeship with Gardner Watson in 1953, and except for two years in the Navy, he was active in the funeral business for the rest of his life. He was a Charter Member of Second Baptist Church serving as President of the Brotherhood, a Rotary Club member, was on the Board of Directors of the Junior Chamber of Commerce and was also a Director for the United Fund. Recognizing that there is no substitute for personal attention and individualized service was something the three partners shared in common. 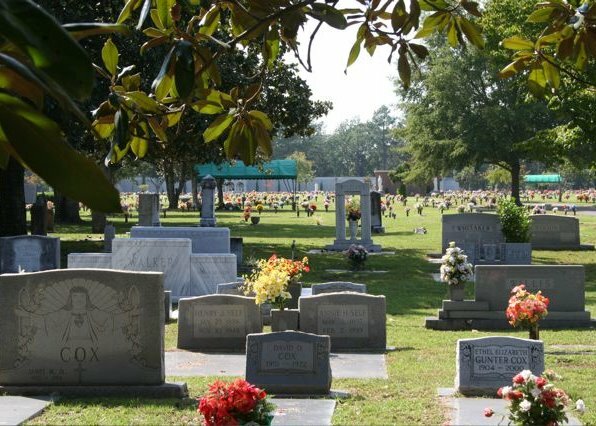 All three partners were licensed funeral directors, and along with their staff, they worked tirelessly to provide Houston County with dignified service in a caring atmosphere. A tradition that to this day we consider a hallmark of our business. 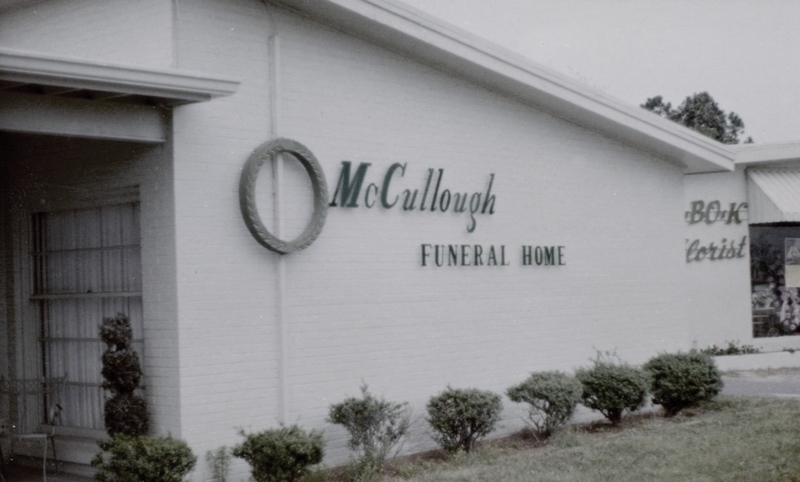 In 1968 Jimmy McCullough bought the business outright from his partners and the name changed, one final time, to McCullough Funeral Home. With the support of his wife, Gail, Jimmy grew the business and became a beloved Warner Robins icon. Since 1968, the business has proudly remained owned and operated by members of the McCullough family. Until his death, Jimmy viewed this business as a ministry to the community. He felt that giving back was not an option, but an obligation; one that he was more than willing to fulfill. His was a vision that we are proud to carry out to this day. Just prior to Jimmy’s death in 1997, Jimmy's sister, Carol McCullough McNeal, purchased the business. At that time, two of her children, daughter Jill McNeal (now Adams) & son Michael McNeal, were already active in the operation of the firm. Over the next several years, a strategic vision of growth became clear to Carol, her husband - local businessman Larry McNeal - and Michael and Jill. With the help and input of the staff and great amounts of research it was decided that a move and expansion was in order to keep pace with the growth of Houston County and to provide families with the best possible facility in which to gather and visit with friends and celebrate the lives of those they had lost. There was travel all around the Southeast looking at funeral homes and various layouts and design ideas to build a state of the art facility. A perfect location was obtained on S. Houston Lake Road and ultimately, construction on the “new” McCullough Funeral Home began. The move to 417 S. Houston Lake was finally made in 2000. It was a bittersweet move, full of emotion not only for the family and staff, but also for many in the community who had buried loved ones - or even gotten married - in the little Chapel of Flowers down on S. Pleasant Hill Road. Still, it was time for a move and with the support of a rapidly growing community we indeed certainly grew into our new home. Since 2000, we have made further additions to continually keep pace with the desires of a changing community and marketplace. As a business, we can never stop evolving to meet the needs of those we are here to serve. To that end, we continue to seek ways to offer what families want as the funeral industry changes, as all things do, with the times. Understanding that planning is an integral part of every successful business, early in 2012 the McCullough-McNeal family began reviewing and planning for estate and business succession purposes. After much consideration and prayer, Michael McNeal purchased his mother Carol’s interest in both McCullough Funeral Home and its sister operation, Magnolia Park Cemetery. Prior to this, Michael had been in charge of the day to day operations of the firm for many years, as well as active as a funeral director and embalmer. After 20 years working at McCullough Funeral Home, Michael feels honored to be able to continue in the legacy his Uncle Jimmy began and that his mother extended. 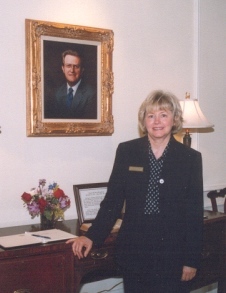 His mother, Carol, remains extremely active in the business and is still an integral part of the day-to-day leadership of McCullough Funeral Home; the transition and sale by no means equaled retirement for her. Michael and his family remain committed to the values that are the foundation of McCullough’s reputation today. McCullough Funeral Home is supported by an experienced full and part-time staff that shares a nearly 70 year old vision of compassionate care with uncompromising professionalism. We are proud of the footsteps in which we follow here at McCullough. We are humbled at the sacred trust so many families continue to place in us on a daily basis. We are thankful for the opportunity to find new and better ways to serve each hurting individual who walks through our doors. To this area we call home: we pledge to remain a trusted resource and partner in any way possible. To God, we give all the glory because we know that it is from Him whom all blessings flow. We look forward to many more generations of helping this community through the most difficult of times with a family owned, family operated, and family oriented spirit of service. To us, this is the McCullough way.